A few weeks ago I went on a walk along the southern side of Gower. The sky was full of heavy cloud and there were small glimpses of better weather in the distance. This coastal wander was dominated by the soundtrack of the sea and in particular the waves. At different spots you could tune in to the repetitive and reassuring sound of the waves lapping against the limestone cliffs or the tidy little beaches. Sometimes the sound was very faint and it was a bit like when you’re listening out for the claps of thunder when you’re counting the length of time between the bangs. As we joined the old route into Swansea – a kind of cross between a footpath and drovers lane – you could hear the waves before you could see the coastline. The small wood either side of the path was filled with the sweet melodies of birdsong and as you descended from the hill-side the sound of the sea grew in intensity and clarity. 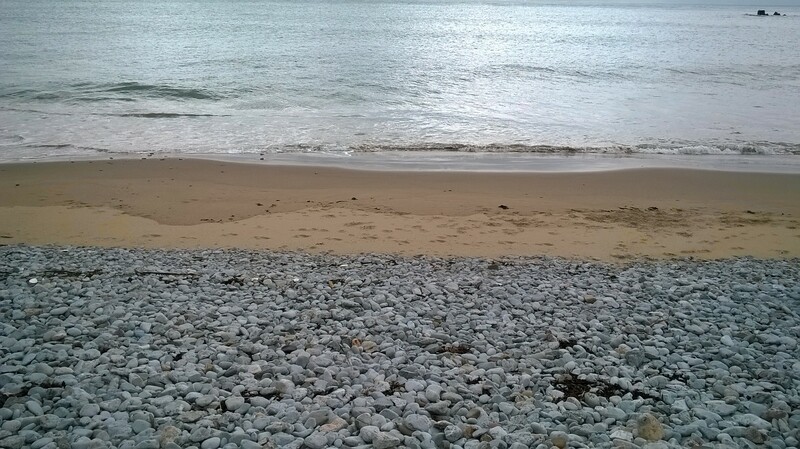 And then through an opening you reached a beach – littered with stones from the old quarry. Hunts Bay is a sheltered little spot and the waves sounded just like you’d imagine waves would always sound. Arriving at a beach like this took me back to the days of GCSE geography. This small bay with its stones and little summit before falling away into the sea is a lovely spot. When on the beach I recorded the sounds of the waves. The full-on sound of the waves on with the direct impact on the sand and stones and then also the sounds from a sheltered spot next to the limestone cliffs. There was a clear difference in the sounds of the waves even though they were only a matter of metres apart. For World Listening Day (Saturday 18 July) this year (the theme is water) as part of the sounds of our shores project we want as many people as possible to record the sounds of waves at noon. This will create a lovely snapshot, a kind of sonic postcard, of how waves sound and what differences that there might be. It will be interesting to see how the size of the stones affects the sounds of the waves or the nature of where the beach is – it might be a big open flat beach or a small narrow beach surrounded by sand dunes. The sound of waves are so intrinsically linked to the sounds of our shores. There is something timeless and comforting about that sound as you first reach the coast – whether to spend a family day at the beach or walking along a coastal cliff. Walking between Port Isaac and Port Quin on the rugged north Cornish coast is pretty special. A landscape battered and sculpted by the sea this undulating walk is part of the South West Coast Path that meanders 630 miles through four counties. And yet go beyond the tourist hot spot that is the South West of England and the opportunity to wander our majestic coast is limited. That’s why the ambition to open up the whole of the coast of England is so important and the lessons from Wales show the benefits that it can bring. Championed for years by the Ramblers and now enshrined in an Act of Parliament, passed in 2009, a footpath around the coastline of England, would link many of the jewels of this beautiful coast. There is a need for the new Government to back the commitment made by the coalition, and the Deputy PM, Nick Clegg, back in September 2014 to deliver this by the end 2020. This means committing money and resource to allow Natural England to help deliver this exciting and ambitious project. The Wales coastal footpath opened back in 2012, the first of its kind in the world, has made great strides in giving people access to hundreds of miles of shoreline rich in nature, archaeological and epic beauty. This is giving people the chance to see their coast anew and generating much needed income for coastal communities. Over the Irish sea in Northern Ireland, the journey to create a footpath along its coastline is just beginning and would be a real boon for the tourist industry. I’ve been to Northern Ireland three times and its coastline is spectacular. Our history, cultural and the story of our nations has been shaped by the sea. 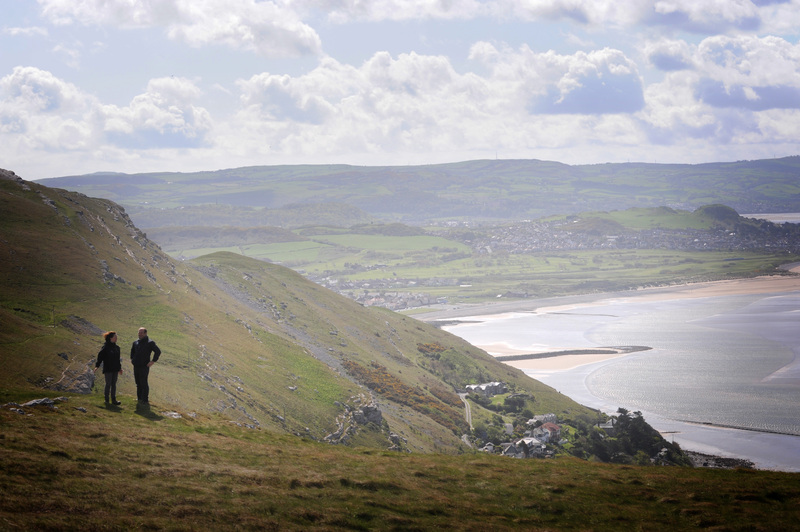 In the last 50 years the National Trust’s Neptune Coastline Campaign has saved, thanks to a people-powered and very British revolution, hundreds of miles of coast; something that it still alive and kicking as seen by the announcement today that the Trust has bought a farm on the wildlife paradise that is the Great Orme in north Wales. The next part of our coastal story needs to look at how we can create the space for people and nature. There is a need to look at the idea of coastal corridors, where footpaths can be moved as the coast changes and we can look to move habitats for nature. This would truly revolutionise our relationship with the coast. I thought that I’d missed my opportunity to see that most elusive of mammals, the otter. Colleagues at a work meeting on the beautiful National Trust Stackpole Estate in west Wales had seen one. Someone spotted some movement by the edge of Bosherton lake and the whole group of twenty people fell silent in an instant, gripped by excitement and anticipation. Even among this group of seasoned naturalists few of them had seen an otter in the wild more than a few times. Slowly some of the group peeled off and crept along the waterside path until there it was bobbing above the still water; the majestic and captivating sight of an otter. I’d made the wrong call and perhaps missed the opportunity to see one of these much love creatured in their natural environment and at one of the best sites. I had seen an otter before but in the slightly artificial environment of captivity. Having read the moving and powerful ‘In Search of the Wild Otter’ by Miriam Darlington I’d totally got the joy and sense of wonder at seeing one of these special creatures. As the mists rolled across the woodland and the Lakes I thought that I’d head for the eight arched bridge that spanned this man made lake at the heart of the estate, more in hope than anything. A brilliant white pair of swans lit up the damp dull greyness of the April morning as birdsong filled the air with its sweet hypnotic melodies. I stared intently along the surface of the lake hoping that my eye would catch some movement. I slowly headed along a gravel track towards the coast and then decided it was time to head back for breakfast. I bumped into a colleague who had just seen an otter and was excitedly talking about its behaviour while someone else emerged from the hillside in a scene straight out of Wuthering Heights and joined by another early riser we finally became a quartet. We looked longingly towards the west of the lake when someone said “there is the otter” and we all did a double take. Then it emerged again with a smooth economy of movement. Out came the binoculars and there was a real buzz among the group. One of my colleagues had had one of those epiphany moments saying that this was the first time he’d seen an otter in the wild and I joined that exclusive club who had seen this gracious and special mammal. This moment in the gloom reminded me of the power of nature to inspire, create that sense of wonder and make the heart sing. Seeing an otter for the first time is one of those moments that stays with you for life and you feel like you want to tell everyone that you see.